The second edition describes and reflects the nature and impact of the numerous developments that have occurred in this field over the past decade, such as the emergence of new speech testing materials; the advancement in the provision of cochlear implants to both adults and children; and the availability of new technology in the form of compact and video discs which has enabled a far wider range of professionals to have access to more sophisticated forms of speech testing. Michael Martin is the author of Speech Audiometry, 2nd Edition, published by Wiley. Chapter 1. Basic properties of speech (Richard Wright). Chapter 2. 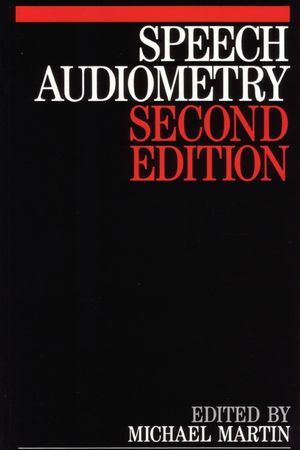 Towards a theory of speech audiometry tests (Paul Lyregaard). Chapter 3. Speech tests in quiet and noise as a measure of auditory processing (Mark E Lutman). Chapter 4. Speech tests as measures of auditory processing (Stuart Gatehouse and Ken Robinson). Chapter 5. Equipment for speech audiometry and its calibration (Tim Sherwood and Hilary Fuller). Chapter 6. Ensuring reliability and comparability of speech audiometry in Germany (Klaus Brinkmann and Utz Richter). Chapter 7. Speech audiometry for differential diagnosis (Phillip Evans). Chapter 8. The uses and misues of speech audiometry in rehabilitation (Roger Green). Chapter 9. Speech tests for hearing for children (Andreas Markides). Chapter 10. Speech perception tests for profoundly deaf listeners (Valerie Hazan). Chapter 11. Testing visual and auditory-visual speech perception (Geoff Plant). Chapter 12. Speech audiometry in the USA (Barbara Kruger and Frederick M Kruger). Chapter 13. The Swedish approach to speech audiometry (Stig Arlinger and Bjorn Hagerman). Chapter 14. Speech audiometry in Australia (John Bench). Chapter 15. Speech tests at the National Acoustic Laboratories (Phillip Dermody and Kerrie Lee). Chapter 16. Speech tests in some languages other than English (John Knight).